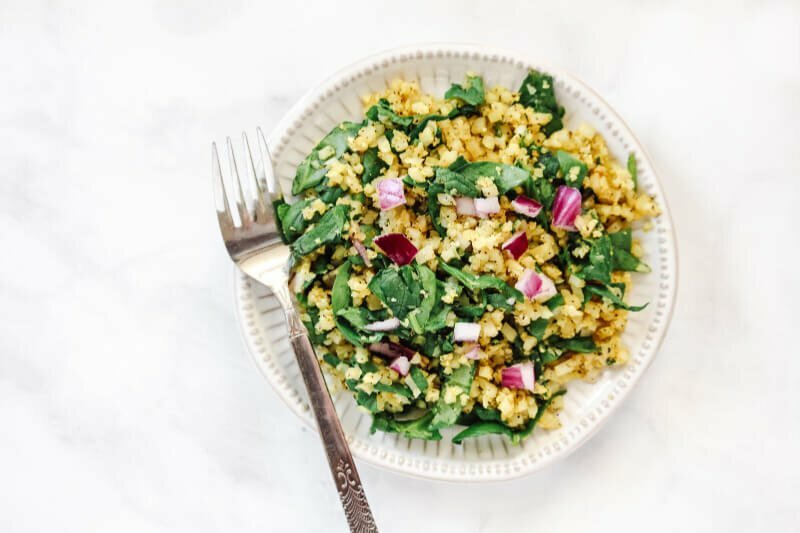 This healthy Gluten-Free Vegan Black Pepper and Turmeric Cauliflower Rice recipe is so easy to make with only 7 clean, real food ingredients and it’s a one-pot dish that’s ready in about 5 minutes! If you’re looking for recipes that follow the Medical Medium protocol, this one has “Medical Medium” written all over it! Was exactly does that mean? 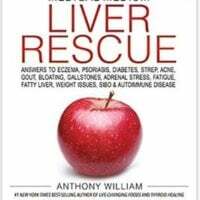 Every ingredient in the recipe is a healing food listed in the Medical Medium: Liver Rescue book that I’ve fallen in love with. I’ve basically made a list of all the healing foods and have been trying to incorporate as many as I can into my meals each day and this one hit the jackpot! 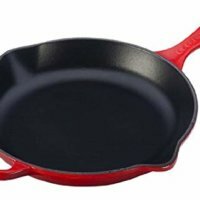 You can make this with only a handful of simple ingredients, in one pan/skillet, in about 5 minutes. Is This Gluten-Free Vegan Black Pepper and Turmeric Cauliflower Rice Recipe Healthy? It’s made with only a few clean, real food ingredients that are all included in the Medical Medium list of healing foods. 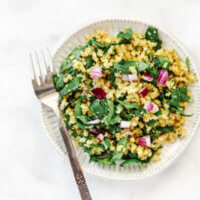 In this recipe, you will be using fresh baby spinach, fresh or frozen cauliflower rice, fresh diced red onions, freshly crushed garlic, and a few seasonings. It’s a great recipe for a quick lunch or as a side dish – although you will need to double or triple the recipe if you are serving more than one person. This healthy recipe is vegan, gluten-free, dairy-free, soy-free, nut-free, lectin-free, paleo-friendly and contains Medical Medium healing foods. 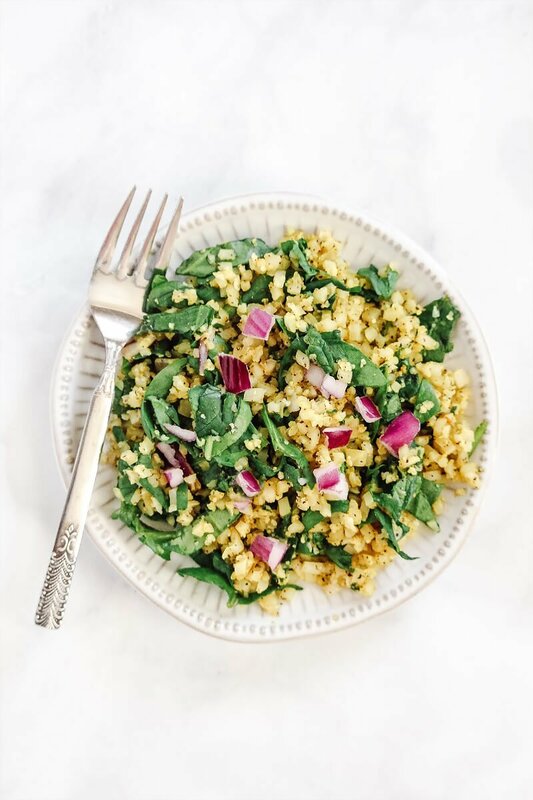 What Ingredients Do I Need To Make This Gluten-Free Vegan Black Pepper and Turmeric Cauliflower Rice Recipe? Want More Clean Eating and Healthy Cauliflower Recipes? 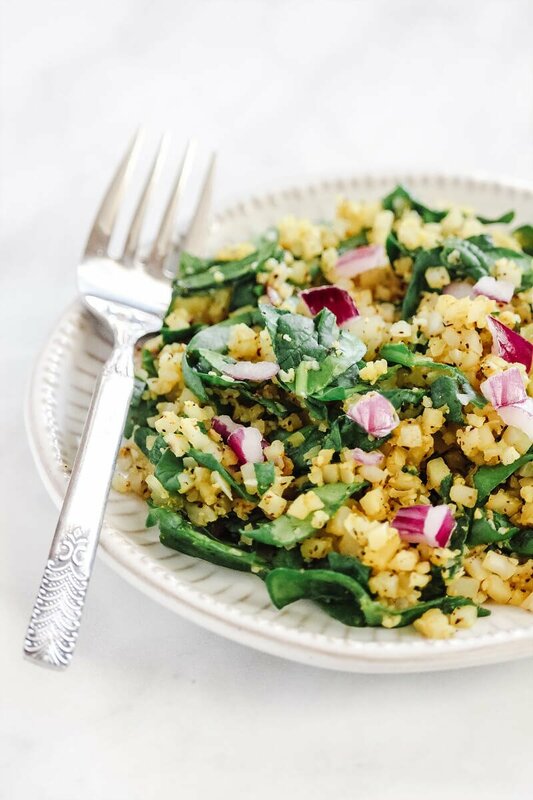 Did You Make This Gluten-Free Vegan Black Pepper and Turmeric Cauliflower Rice Recipe? Add all ingredients to a non-toxic skillet and gently saute' until the cauliflower rice is warm. 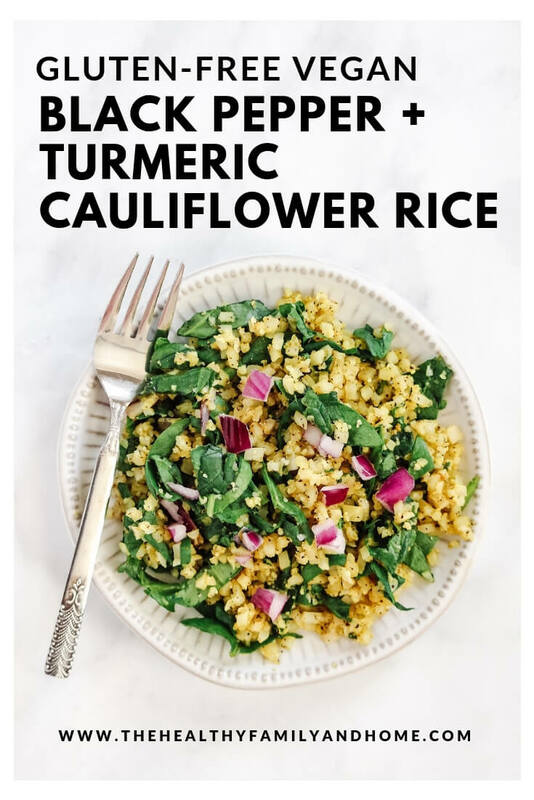 Copyright Notice: The recipe and photographs for "Gluten-Free Vegan Black Pepper + Turmeric Cauliflower Rice" by Karielyn Tillman of The Healthy Family and Home website are copyrighted material and are protected by the Digital Millenium Copyright Act (DCMA). 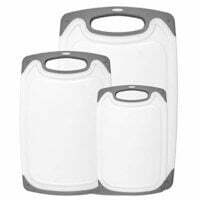 They cannot be used legally without my written permission.